Much ado over a paper bag. When Erika Esmurria appeared in Haverhill District Court Monday to answer to drug charges, court-appointed Attorney James J. Carney took police—and the Commonwealth—to task, despite his client’s status as a parolee. The incident began Friday afternoon when police say Haverhill’s Christina Dube engaged an alleged “hand-to-hand transaction” with Esmurria involving a Dunkin’ Donuts bag in the River Street McDonald’s parking lot. 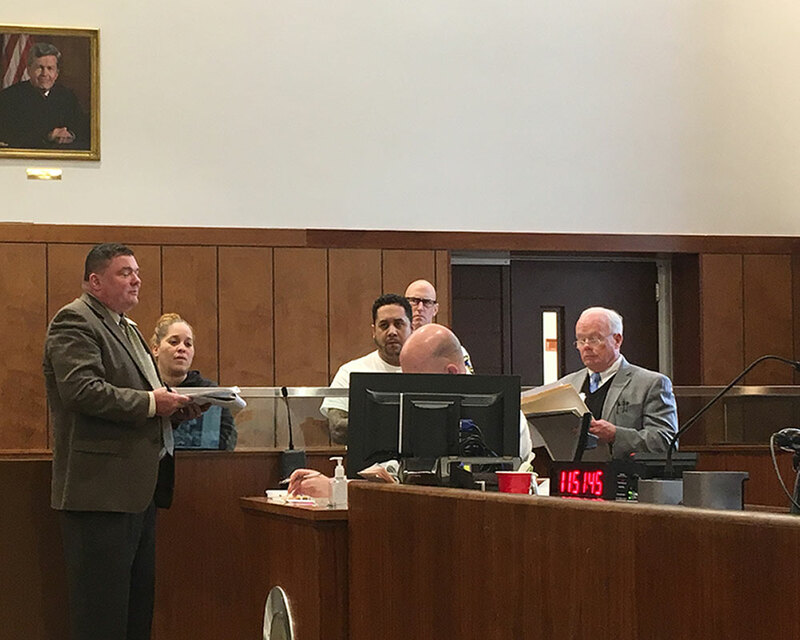 When stopped by Haverhill Police Detective Tiffany Maldonado, Dube removed a small plastic tube of white powder and told Maldonado she purchased cocaine from Esmurria and codefendant Angel Rivera. According to Esmurria’s lawyer Carney, Haverhill Police failed to provide probable cause for Esmurria’s arrest, which took place after a traffic stop near the High Street Market. “It’s amazing that in the City of Haverhill that anybody with a New Hampshire plate or a Maine plate is involved in criminal activity in a high-crime area. My client was pulled over after a Dunkin’ Donuts bag was handed to her. That’s all the Commonwealth has—a Dunkin’ Donuts bag…I don’t even think it passes the sniff test,” he argued. Appearing at arraignment alongside codefendant Angel Rivera, of 570 South Union St., Lawrence, Esmurria had her bail set at $100,000 by Judge Stephen Abany, who took her four-page record—including a federal probation violation—into account when imposing the fee. Assistant District Attorney Thomas Sholds originally argued for $250,000 for the same reason. Sholds said the incident mirrors the “classic scenario” for an out-of-state drug deal. Arrested along with Esmurria Friday, Rivera was represented at arraignment by Haverhill attorney Scott Gleason. Charged with motor vehicle and drug violations, he also has outstanding warrants for armed robbery, assault and battery with a dangerous weapon and mayhem. Abany ordered him held on $250,000 cash bail until a probable cause hearing in May. Dube was summonsed to court for her role in the incident. Your privacy is very important. WHAV will not sell, rent or give your personal information to anyone. If you’re not already helping to pay for local news, please consider making a donation. © Copyright 2019, Public Media of New England, Inc. WHAV® is a registered trademark.